How an arcade game constantly exceeded expectations. As society advances, so do our sports. Some went extreme, opting for massive jumps over frozen landscapes, while others went more street, doing flips and tricks on urban streets with a variety of different wheels. Only when they came together into a supernova of gnarlyness were we blessed with the sport of FutureGrind. 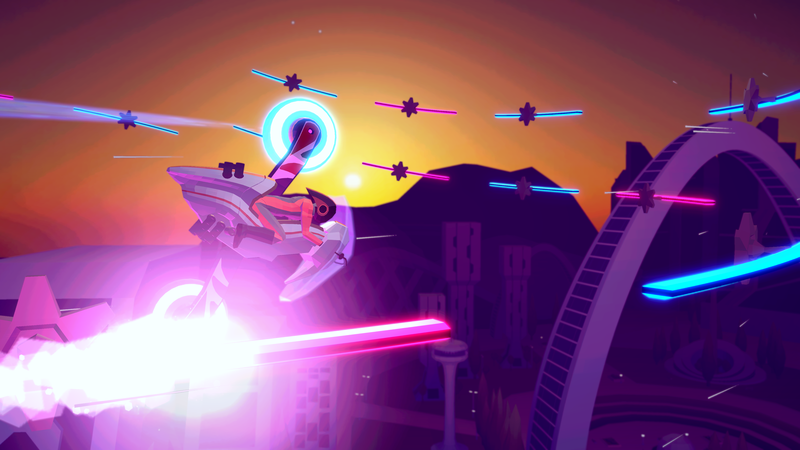 FutureGrind is a fast-paced arcade platformer, in a sense. Players operate what is essentially a giant fidget spinner as they grind along a large and complicated series of rails. 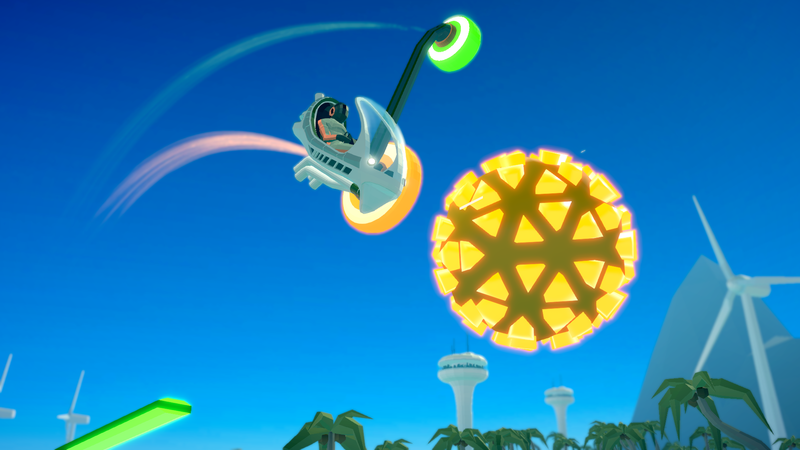 Facing different wheels, vehicles, and hazards, the player strives to both complete the stage and get the highest score they can while doing so. At first, the game was somewhat underwhelming. The tracks were short and quick. This not only was somewhat unstimulating, but the bumping vaporwave music would often cut out before "the good part" actually dropped. "But then it got better." I couldn't count on both hands how many times I had that thought. FutureGrind manages to, throughout its entire experience, exceed my expectations. The levels grew longer and more challenging, the music actually played out, allowing me to hear how impressive it really was. My options grew and my skills alongside it. By the end, I was performing totally radical moves and sick tricks like a Surge Cola poster child. FutureGrind's creative direction will be both the first and the last thing you think about. It introduces itself as an 80's synth dream, using the creative neons and blacklight tones familiar of an era now gone. Overlaying the visuals are rolling beats and retro electronica melodies. It doesn't stop, either. Even with its stylized low-poly models and textures, it manages to build an impressive ending. The game has a small narrative to drive it. You are an extreme sports athlete, each bike is owned by a brand that you sign on to. It eventually evolves into more. I was surprised to see an actually interesting story in a game like this. For spoiler's sake, I won't go into detail, but it absolutely stuck with me how they managed to take a simple arcade platformer like this up to 11 the way they did. Gameplay holds itself up rather well. The overall gimmick of the game, rotating the vehicle to have the correct wheels on the correct rails, was something I hadn't seen before. While it manages to build on the idea throughout the entire game, it never becomes so complicated that I couldn't keep up. FutureGrind's difficulty curve is nearly straight as well. It gradually grew harder and harder as I played, with no single instance showing a noticeable jump. Unlike most try-and-repeat arcade games, this one made me feel cool. Something about the visual, music, and seeing myself skillfully grind along rails like someone out of an X Games promo instilled a sense of self-pride. I was lookin' pretty gnarly, bro. I could only imagine what a speedrun of the game would look like. While difficult in the late game, the developers are very considerate. They include an option called Assist Mode. They clearly explain the purpose of this mode in the menu, remarking that not everyone is a pro gamer and want help with difficult parts of the game. This includes disabling the mandatory wheel color matching and an option to slow the game down for better reaction times. I was entirely thankful for these features since the end-game content was far more difficult than I could have managed on my already limited time frame. The "considerate" remark was directed toward Assist Mode, but also includes the smaller additions like color blind options and low-end PC functionality. All of it comes together to show that the developers really did care about making a good game that everyone can enjoy. The game isn't perfect, however. There were a few things that had chuffed me in the bad way as I played. Most of these were smaller aspects that simply didn't mesh with my personal preferences, but I would be remiss if I didn't remark on some of the more conceptual problems. The first issue I noticed was with the bikes. There are a small handful of vehicles you operate, each one with different shapes and abilities. One aspect of nearly all these bikes was a drifting effect. If you are spinning too hard, it can be difficult to right yourself. This would often lead to me crashing and failing. The drifting nature reminded me of why I hate Ice Levels so much. Thankfully, one of the vehicle options disabled drift entirely. Except that I had no control over what bike I use. Each level has a bike designated for it. It makes sense, the stage was designed with those specific models in mind. But when you go from your favorite bike to one you despise (cough, cough, the off-center rotation bike), a sense of bitterness develops. Had the drifting option been part of the Assist Mode, I'd have enjoyed the game remarkably more. Then there's the difficulty. When criticizing a game, I try to take difficulty out of the equation as much as possible. Just because I'm bad at a game doesn't mean it's a bad game. But there's a special balance to be had with the struggle and satisfaction of playing a hard game. No matter what kind of player you are, FutureGrind will become a challenge for you. The late game levels are outstandingly hard. If it wasn't for the Assist Mode options, I'd probably never have beaten the game. This did leave me with a choice: do I give up and not know the taste of victory, or do I sully that victory by accepting a handicap? As considerate as Assist Mode is, it still is defeat in a different sense. That's only a small hindrance to the overall experience. Less obvious than that was the narrative direction it had tied into the game. You can have a hard game, or a narrative one. When you try to have both, something suffers. If you have a linear, engaging story, but hide the conclusion behind a difficult situation, you run the risk of casual players never actually reaching that narrative climax. The two aspects need to remain separate if you want people to enjoy both. Take Dark Souls for example. Its lore is deep, rich, and engaging. But it's also entirely optional. You can play and beat the game without knowing anything about the story. But if you want that story, you can find it without much difficulty. Separating the difficulty from the story allowed people to enjoy both as they see fit. FutureGrind consistently surprised me. I came in, expecting a mindless, platformy experience to play while I watch re-runs of the Office on the side. Instead, I was given a continuously entertaining and interesting evening. With the help of Assist Mode, I completed the game in about 6 hours. For these reasons and the ones described above, I rate the game as follows. If you like Super Meat Boy and the 80s, then you'll like FutureGrind. Even if you don't, you won't have a bad time. It's fairly priced, as well. All in all, I recommend giving it a shot. FutureGrind was developed and published by Canadian game designers and developers Matt Rix and Owen Goss as Milkbag Games. It is available now on PC, PS4, and Nintendo Switch for $19.99.